No doubt everyone has a rebellious side to them right? That’s what’s happening to The Rebel Cat & The Bosozoku Neko from The Stray Cat Series. Remember “The Stray Cat & Mei Neko” from Hong Kong artist Knoa Chung the famous artist behind the lovable Flower Fox and Uncle Ko, powered by Onederland Toy (Kaiju One – Pink Label). The Rebel Cat & The Bosozoku Neko series 2 made a surprise debut at DesignerCon 2018 which you can check our LIVE stream below. Now with Dcon over and done with for the year Onederland Toy have launched them online for collectors who couldn’t make it to Dcon. Once again, for us these are cute with that vintage vibe to them both, talking us back down memory lane reading classic Asian comics. The Stray Cat a bad boy gangster wannabe wants to pick the girls and dresses to impress Mei Neko outside the chaotic school and The Stray Cat doesn’t realise Mei is an undercover cop! Will Stray Cat charm and badboy luck win Mei Neko heart or get himself in trouble and land him in jail? 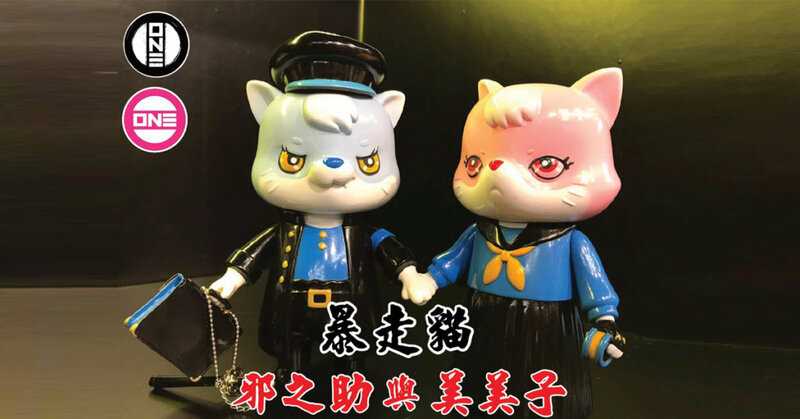 The set includes the Male Rebel Cat ( with school bag ) and the Female Bosozoku Cat ( with either baseball club / short sword), together with an extra magnetic hand that can hold together. PRICE: US$100 for the PAIR. Find Onederland toy on Instagram. Also find Kaiju One on Instagram and new Facebook page HERE.